A brave pensioner plans to abseil 160ft down the Sea Walls of the Avon Gorge on Sunday to raise money for his local branch of Cats Protection. 70-year-old George Russell, a cat lover and keen volunteer, will be taking part in the abseil on behalf of the Swindon Branch on 8 March. 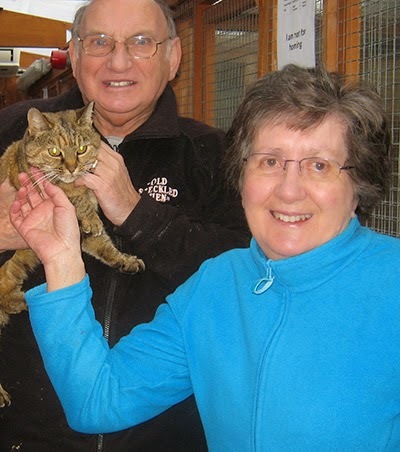 "I've been a volunteer with my local branch of Cats Protection for over 20 years," George says. "I want to do something extra special to help raise funds for all the cats that need it. "I have never done an abseil before and it sounded like a challenge. I know that some of my colleagues at Cats Protection are going to be facing their fear of heights when they take part, but I don’t feel scared as I know I’ll be in safe hands. I am really looking forward to it and hope I can raise as much as possible for the charity." Rebecca Worth, Regional Fundraising Manager for Cats Protection and the event organiser, says: "We are very excited about the abseil and hope that it will help raise vital funds to help the huge number of cats that come in to us. We are delighted that George is taking part and hope his enthusiasm will encourage other people to sign up for the challenge." Don’t let allergies hold you back! Don’t forget the moggy mums this Mother’s Day! Feline behaviour explained – why does my cat…?